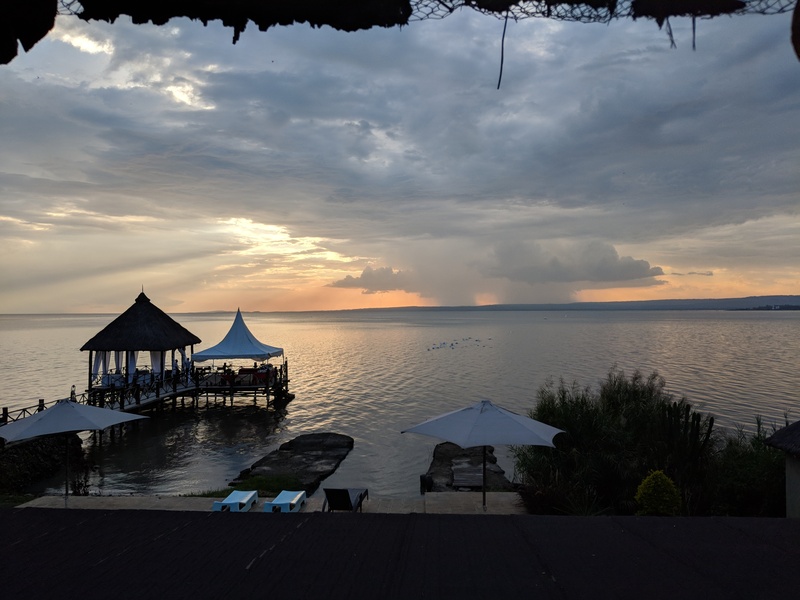 The first night in Kisumu consisted of dinner on the hotel pool deck and an early night to bed for most of us. For Day Seven, we again broke into 3 groups. My group went to the Siaya district to visit with one of the village’s taking part in an extensive study on Universal Basic Income. We left the hotel early and drove out into the country. We met and spoke with a diverse group of individuals who were receiving the monthly UBI benefit. Each of them had been receiving it for two years, and as a part of the long term study will continue receiving it for five more. We asked them about their experience with the program, how they felt it helped them, and what they had been able to do as a result of the steady income. The most consistent answer that we heard was their new ability to make long term investments and plans. 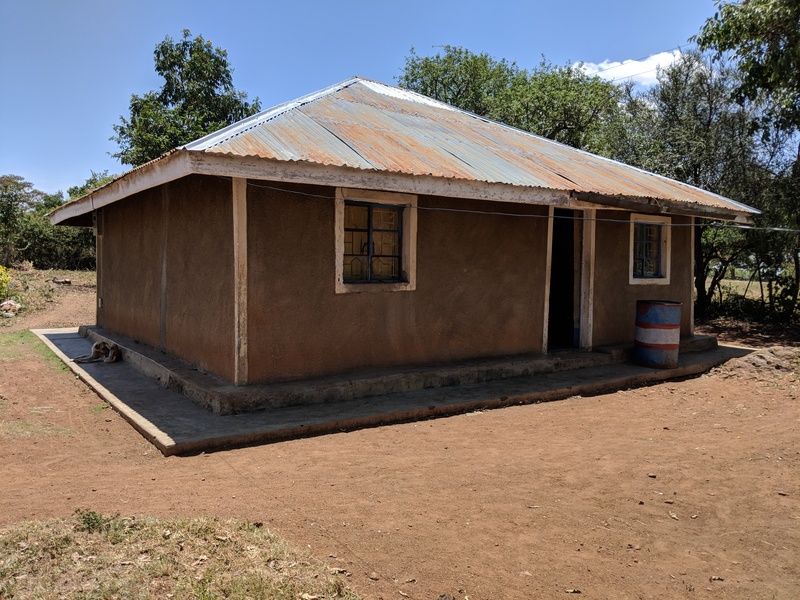 Village home in the Siaya district. On a few occasions, when I asked questions, members of my cohort had to repeat them for me. At first I thought it was because I was phrasing things in a strange way, but I was told it was actually my accent. I found that really interesting. I was really impressed by the number of people I met, both from my cohort and on our site visits, that could speak three or more languages. As my colleague Zipporah explained; most people there first learn their mother tongue, then Swahili, and then English. One of my regrets is not taking enough time beforehand to commit more of the greetings and common phrases in Swahili to memory. Between my American education and coming from a monolingual household, different languages have never come easily for me. 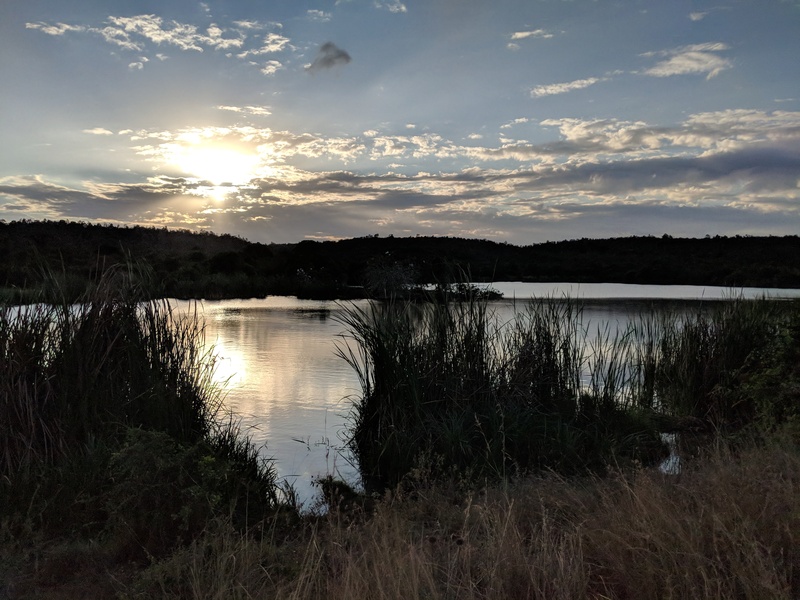 One of my takeaways from this trip, as well as my trip to Barcelona earlier this year, is to make a conscious effort to do better on that front. One of the most fascinating concepts I encountered on this trip was the idea of the Merry-go-round, also known as a Chama and a plethora of other names. When I brought this up to some of my cohort, I learned it was widely practiced all over Africa. The concept was completely new to me. In the village we visited, twp of the people we talked to were in the same one. The idea of it is simple: a small group agrees to pool together a set amount of money on a monthly basis rotates who gets the pot. An example to illustrate the point:10 people put $100 each into a pot every month, and rotate through the 10 individuals for who gets the $1000 pot each month. In this village, they were using this to make larger investments in things such as livestock. The idea requires a lot of trust and accountability, but allows individuals to cover large expenses while keeping things on a sustainable monthly budget. One of the reasons that the Merry-go-round concept resonated with me is that I think it's something I can take back to the comics and writing communities back home. Namely; it could be a worthy alternative to over-saturated platforms like Kickstarter for the up-and-coming creator. I don't know if it would take, but there's potential there and you can expect I will be writing more about it on here in the future. On a random and unrelated note; my phone did not get a signal at all outside of Nairobi for the entire trip, with one exception. On the couch in the last home we visited, I randomly got an influx of Whatsapp messages and had two whole bars. After that, it was back to the hotel. 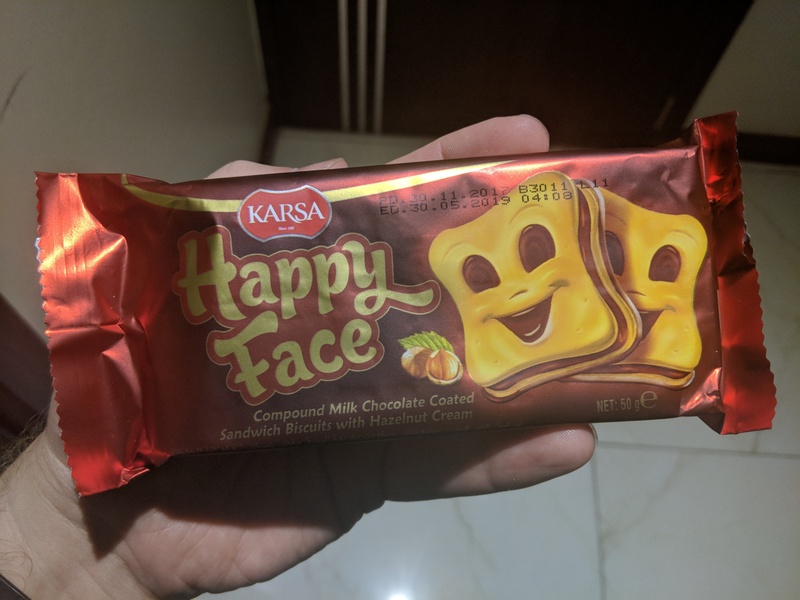 My new favorite slightly terrifying snack food. That night after some group reflections, a small group of us walked through downtown Kisumu to find some food. There wasn't a lot in terms of options, but we ended up finding a supermarket. This turned out to be a good excuse to get lots of oddly named snack foods and Kenyan-grown tea (some of which I was just drinking this morning). A small group of us ended up eating at a restaurant across the street room the hotel. 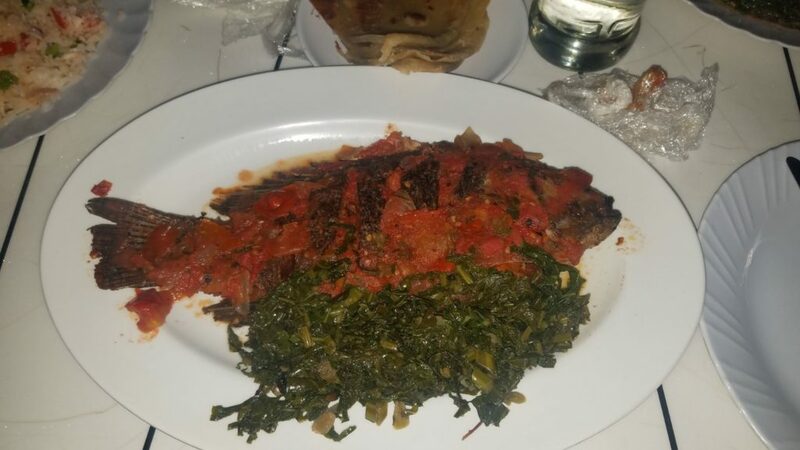 I had fried fish, which arrives whole and requires some thoughtful chewing. Helen and I also made friends with the restaurant cat. Fish dinner at TLC, Photo by Helen. I spent the rest of the night negotiating page rates on a short comic I have coming out in an anthology soon. The hotel was having a party out on the pool deck, which was right outside almost all of the bedrooms in the hotel. I didn't mind that I could feel the bass in my room until I had to actually get to sleep after midnight. All in all it wasn't that bad, just a little baffling that a hotel didn't seem to anticipate that a concert on their pool deck going past midnight might be a problem for some of their sleeping guests. 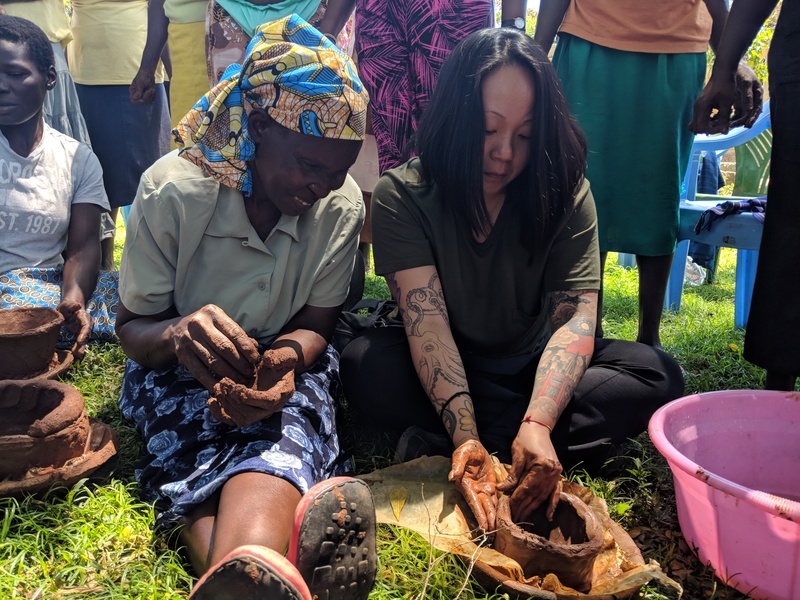 Making clay pots with the women of Seme County. Day Eight started with a panel on Investment and Disinvestment in Kisumu, which has been historically neglected by the Kenyan national government. It helped give a historical and political context to the different site visits our cohort went on in Kisumu. We then had some breakfast at the hotel where I and a few of my cohort were introduced to some Kenyan-based LGBT activists. I was very interested to get some first hand observations on the state of LGBT rights in Kenya as well as the overall region of Eastern Africa. We were invited to a Pride celebration taking part in Kisumu that evening, but were ultimately unable to attend. After breakfast, our cohort split into two groups. I was with the group that drove out to Seme County to learn about some traditional pottery and the challenges facing the women in today's economy. After introductions and singing, we got to dig our hands into some clay and make pots. Well, not all of us got to make a whole pot. 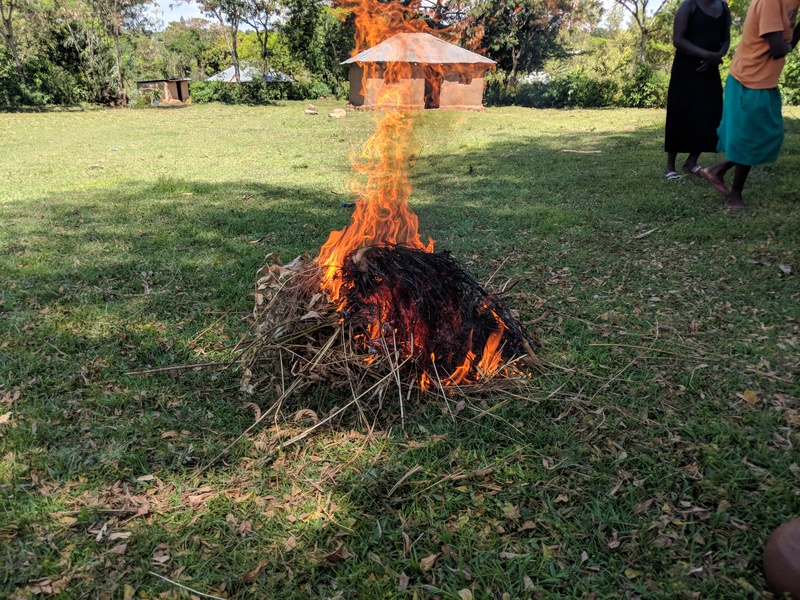 They even lit a small kiln fire of some already finished pottery (pictured below) as the ones our group made would not be dry enough to fire for several days. They talked about their difficulty with finding a market for their traditional pottery and their hopes of learning to make jewelry. Visiting Seme County was a stark contrast to the previous day, where we everyone we met was receiving a Universal Basic Income stipend. One thing that seemed fairly consistent through everyone's site visits in Kisumu was the lack of economic opportunities that the people faced. With the UBI, there was hope of building a more prosperous future, but for the women of Seme County, the reality was much more harsh. The women were kind and welcomed us into their homes. They shared with us their traditional pottery. They made us ugali and it was delicious. Taking into context that morning's discussion on Kenya's historic neglect of the region, it was impossible to not see the toll that is taken on the people who see no way out of poverty. It was one of the uglier truths I had to sit with on this trip. After we left Seme County, we met up with the rest of our cohort at the Kisumu Impala Sanctuary on Lake Victoria. 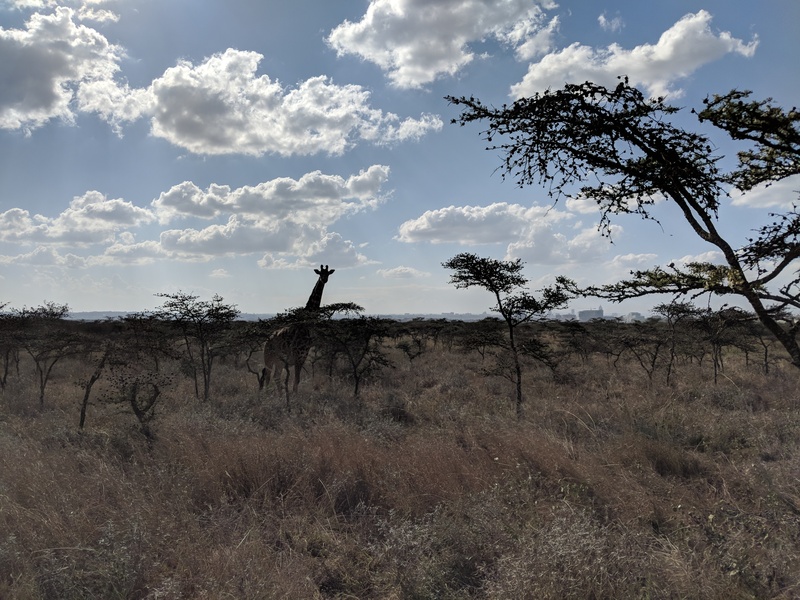 As most of our trip was focused on the people and the political culture of Kenya, this was one of our only real opportunities to see any wild life up close. The animals in the sanctuary are largely rescues from illegal captivity. It was nice to unwind a bit after some of the heavier subject matter we'd dealt with over the course of the day. 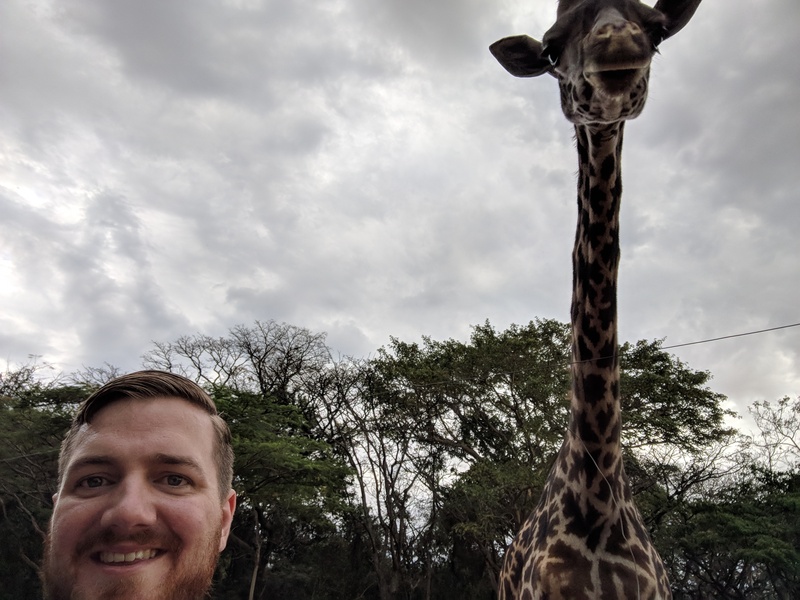 I took some close up video of an ostrich eating, and took my best selfie ever with a giraffe. The best selfie I will ever take. After walking around we headed to the ledge for some group debriefing on our day. That's when I took the picture of the sunset up at the top of this post. Dinner followed along with some traditional drums and dance performances. We ate out on the docks. 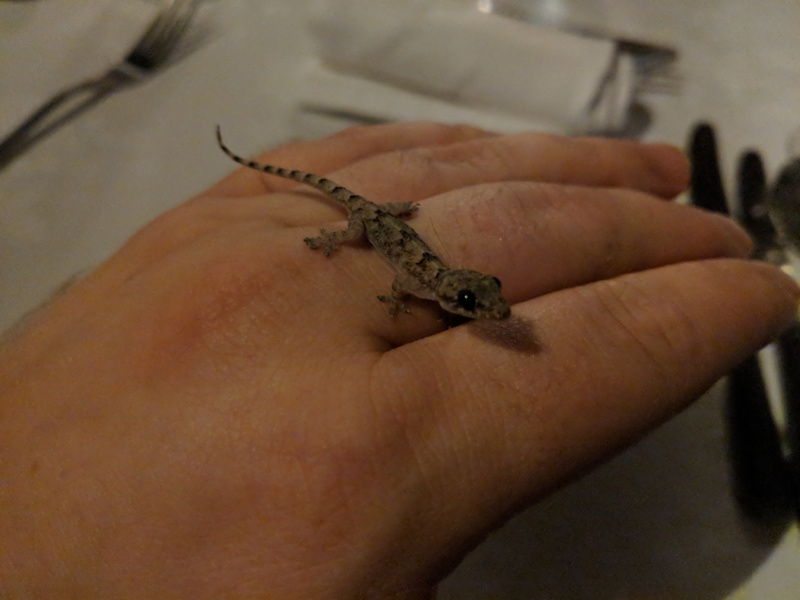 I made friends with a gecko. We held eye contact for a long time. Making friends with a gecko. It was our last night, so a small group of us got drinks at the hotel bar afterwards. I stayed out until around midnight before heading back to pack my bags one last time. Mini-Safari through Nairobi National Park with the top up. After checking out, we had one last round of group reflections. I found myself on that last day thinking a lot about the queer culture that exists in the shadows of every country, some more deeply hidden than others. I've reflected a lot on the privilege of being seen for who I authentically am and not having to live my life so carefully guarded. I thought a lot about how queer people have existed in every culture and every bloodline throughout history, and where my place is in all of that. We ended with an exercise where we picked a postcard that spoke to us from a deck that was scattered on the ground. I chose an image of our planet. I was thinking a lot about my place in the world, how massive and cruel and beautiful and unforgiving it can be. I was thinking about shifting perspectives, and how everyone sees the world differently. We were told to put our postcards someplace where we would see it every day to remind us of this experience; I hung mine upside down above my desk. The flight back to Nairobi was quick and painless. A bunch of us said goodbyes at the airport; a few rushed off for connecting flights. Others were staying for some extra days. I ended up with a group of seven of us that had a whole day to kill before our flights back home. 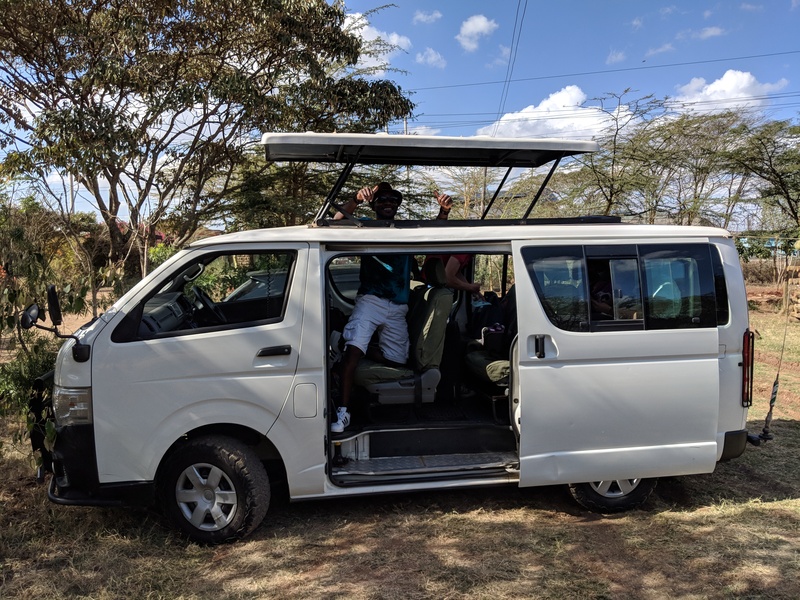 We ended up taking a mini safari day trip to Nairobi National Park. We got to pop the top up on the all terrain vehicle as we drove around to spot some wildlife. More giraffes, Nairobi skyline in the background. We saw more giraffes and ostriches. There was a rhino way off in the distance, and we got to see two lions eating after a fresh kill. Unfortunately I did not see any elephants the entire time I was there, but it was a great way to spend the afternoon. We went to a place called Carnivore for dinner; as you might guess they specialize in meat. I drank a fair amount of Dawa cocktails and tried Ostrich and Crocodile for the first time. The setting sun on my final day in Kenya. Then it was back to the airport again; we said our last goodbyes and headed off to different terminals. The first flight went smoothly. I had a number of Dio fans compliment my Rainbow shirt at the Amsterdam airport. I watched Love, Simon and The Lion King on my second flight. I don't know if I can explain my choices there; maybe I felt like crying and then got nostalgic? That's what happens when you're exhausted but can't sleep on planes. I landed in one piece, and managed to get back into my apartment in spite of forgetting my keys. I returned to the spot I had left 10 days earlier with a lot to unpack and process. I'm still unpacking and processing it. This was a trip that will stay with me for a long time.